Competition between larval populations of O. triseriatus and A. albopictus was assessed by comparing per capita growth rate estimates for experimental cohorts of larvae developing under a variety of initial density combinations in fluid obtained from tires or from treeholes. Estimates of per capita rate of change were calculated. Estimates of carrying capacities and competition coefficients indicate that competition between the two species will result in stable coexistence in treehole communities (below, left), and local extinction of A. triseriatus in tire habitats (below, right). Isoclines, or estimated combinations of each species that permits equilibrium, are shown in the shaded regions. 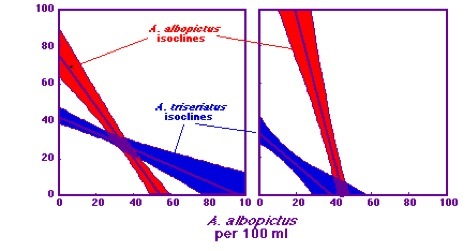 The vertical axis represents the initial density of O. triseriatus, and the horizontal axis shows the initial density of A. albopictus. Crossed isoclines suggest a stable coexistence between the two species. The different nutrient input rates of treehole vs. tire conditions probably account for different carrying capacities in the two situations, although this alone probably does not account for the changes in competition coefficients (alpha) in the two habitats. If these coefficients reflect overlap of resource use, the differences suggest that resources exist within tires that can be used much more effectively by A. albopictus than O. triseriatus, and that treehole fluid contains resources that each species exploits differentially. We do not know how this occurs. Our results indicate that competition with the predominant species in treehole communities, O. triseriatus, will, by itself, be insufficient to prevent the establishment of A. albopictus.